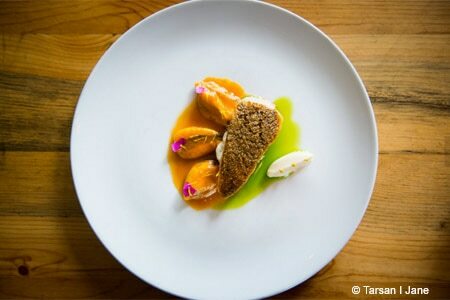 Creative, cutting-edge Spanish cuisine comes to casual Seattle. About the restaurant & décor: While much of the cooking in chef Perfecte Rocher's open kitchen happens over the wood-fired grill, in full view so diners can “ooh” and “aah,” the sensibility behind his Valencian cuisine hails from a more contemporary place. The airy, spacious dining room with cool colors and high ceilings leaves plenty of space for Rocher to play with food ideas. And play he does, offering only chef's choice tasting menu options --- 12 courses at the table or 18 at the counter --- plus a paella brunch on Sundays. The parade of courses, each focused on a single ingredient and prepared with modernist techniques, sounds somewhat fussy, but the casual feel of the environment keeps the meal from being pretentious. Likes: Food; chef's counter; gin and tonics. Food & Drinks: Carrots arrive three ways, and next come hot and cold peas followed by whole, heads-on prawns with a smoky cream sauce. Spanish ingredients and traditions inform the cuisine, but it also has a distinctly glitzy, high-end vibe that's rare in Seattle. Another rarity: desserts that compete for attention with the savory dishes. For example, house-made goat cheese ice cream is set afloat in strawberry compote and juice, while Catalan pastry cream shows off a regional take on crème brûlée. As might be expected, the wine list is almost entirely Spanish, with offerings by the glass or bottle, or paired with the courses. Beer and cider are local and Spanish, while the cocktails highlight a variety of gin and tonics.